Luke Wright says Sussex might have to consider splitting the captaincy roles in future. The 32-year-old stepped down last week after less than two years in charge, admitting his return to the ranks was 'a big weight off my shoulders'. Chris Nash took over and led Sussex to an important win over Worcestershire at Hove. Nash will be in charge again tomorrow (Friday) when Sussex head to Grace Road to face Leicestershire, but Sussex’s nominated vice-captain is Ben Brown, who faces at least two more weeks on the sidelines as he recovers from a broken finger. Head coach Mark Davis and his management team will then have to consider whether Brown can lead the team in the Championship and the forthcoming NatWest T20 Blast as well as keep wicket and bat in a key position at No6. It’s a big ask, especially as he wasn’t an automatic selection in last season’s Blast, and a possible solution for Sussex could be to appoint the hugely experienced Ross Taylor for the T20 competition. Taylor led New Zealand across all formats between 2010-12 and even reprised the role for a one-day international against India last year. 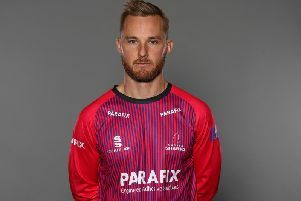 He is currently playing in the Champions Trophy before he links up with the Sharks for the start of the Blast on July 9. “I guess it is an option for the club,” added Wright, who played alongside Taylor in the IPL for Pune Warriors and when Taylor was with Sussex for last season’s competition. If Sussex do split the captaincy they will join five other counties – Gloucestershire, Leicestershire, Middlesex, Nottinghamshire and Somerset – who have gone down that route this season. South Africa fast bowler Vernon Philander plays the last game of his spell with Sussex against Leicestershire and Davis says they have no plans to look overseas for a replacement when he links up with his compatriots for the Test series against England. Instead, opportunity will be given to the likes of left-armer George Garton, who was with England under-19s last week, and Stuart Whittingham. Steve Magoffin will miss the trip to Grace Road but Sussex hope the Achilles injury he picked up against Worcestershire will not keep him out for a prolonged period of time.